PuTTY is a free open source terminal emulator, serial console and network file transfer application. It supports many network protocols, such as telnet, SSH and raw socket connection. After completion of downloading the package for windows, follow the steps. Run it and select ‘Next’. By default, the installer will install in C:\Program Files (x86)\PuTTY (C:\Program Files\PuTTY for 32-bit systems). Select “Next”. In ‘select start menu folder’, create shortcuts and click ‘Next’. 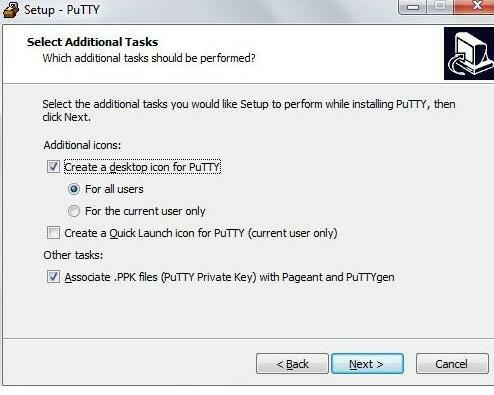 In ‘select addtional task’, just choose the ‘create a desktop icon for PuTTY’ and click ‘Next’. The installer will review your choices and select ‘Install’ after you have down. Finally click ‘Finish’ button. Note: There is also a portable version of PuTTY is available, in case you don’t want to install PuTTY on windows. Just search for “Portable PuTTY” and you will find many options. Just download and open it to run basic PuTTY without any installation. To connect the PuTTY into the Remote server, Provide the Hostname or IP address of the remote server and the port number of which the SSH server is listing. The default port number is 22, if you install SSH server you may use different port. Click open to start the SSH session. If this is your first time connecting to the server, the following window should appear. Click ‘Yes’ to accept the connection. Once the SSH connection is established, you should see a terminal prompt asking for your username. Connect with your SSH user of the choice. Next enter your password, note that you will see your cursor moving or any characters typed (such as *****), when typing your password. 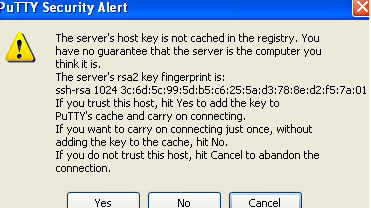 This is the standard PuTTY security features. Hit enter. You are now logged into your server with SSH, you should see the output as follows on the prompt terminal. Now you can begin typing comments to use PuTTY. Now you can begin typing commands at the prompt to use PuTTY.